Adjustable multiple skull adorned gothic style wicked costume slave bracelet with attached claw fingernail tip rings. Unisex style is so cool for both men and women! 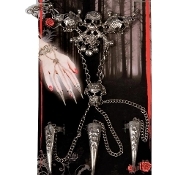 Gothic Bracelet and Claw Nails Hand Jewelry is the perfect accessory for steampunk cosplay adult or teen costumes. Dark World punk style metal bracelet hand jewelry features a skull and cross bones medallion with two attached chains leading down your hand to a skull applique midway, with three additional chains attached to three (3) adjustable size claw shaped finger nail tips to apply to your index, middle, and ring fingers. Includes: Wristband Bracelet Chain with Three Adjustable Size Claw Nails attached.